Our LG G5 didn’t come with any Friends modules, like the Cam Plus or Hi-Fi Plus. It’s not even a reviewable unit—LG cautions it’s “pre-production preview” hardware, and the user experience could be different in the final shipping version. And on top of all that, we got the pink iteration of the G5. Too bad we ran out of Hello Kitty stickers, because they’d look perfectly at home on this phone. Yeah, the G5 I’ve been using for the last 24 hours comes with a few caveats—but none of them are serious enough to prevent me from drawing some early conclusions. LG has done a lot to reimagine its flagship Android phone, and while not all of its design decisions are successful, they’re all bold and inspired. Indeed, in this age of Android samey-sameyness, we have to give LG props for relentless innovation. With 554 pixels per inch, the 5.3-inch display looks great. 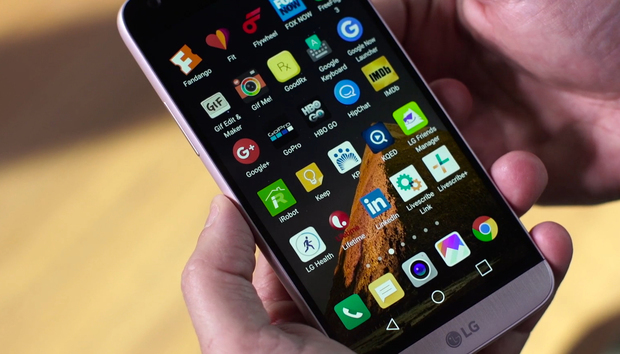 But we lament LG's decision to ditch the Android app drawer. Last year, I used the LG G4 for about five months as my daily driver, so I’m fully versed on that phone’s strengths and weaknesses. As such, the G5’s unibody metal shell emerges as LG’s biggest improvement. Sure, I sort of miss the G4’s funky leather back-panel. Ditto the G4’s more angular (and interesting) body lines. But there’s no disputing that LG finally has an expensive-looking, premium-feeling smartphone in the G5. The “microdized” metal surface has a soft, almost glowing luster. And with just the hint of texture to it—a certain, undefinable toothiness—the G5 feels a bit more grippy than its arch-rival, the Samsung Galaxy S7. The LG G4 (left) has character thanks to its leather back panel, but that material picks up dirt, and the entire look and feel can’t match the panache of the G5 (right). The move to a unibody construction certainly wouldn’t have happened if LG hadn’t first overhauled the phone’s approach to battery swaps. The ability to replace a dying battery with a fully juiced battery has long been an LG selling point, and the G5 makes this operation even easier. Instead of prying off the back panel with a credit card, fingernail or spork, now you just press a button on the G5’s side, wiggle out the 2800 mAh battery module, and then pop in a fresh cell. Removing the battery module isn’t as easy as, say, ejecting an SD card from a card reader. It does require a bit of negotiation. But do you really want it to be much easier? It’s not a headphone plug or power cable. It’s a battery, and needs to stay locked down under challenging circumstances. The bottom line is I’m impressed by the clench and muscularity of the battery lock. I think it will survive many more drops than than the G4 ever did. The new clamping scheme also speaks well for the G5’s Friends accessories when those eventually arrive. This is where the battery section snaps into the body with a confident click. Note the release button on the side. Along with the new metal body, LG moved its volume rocker off the back panel, and onto the side of the phone like a proper piece of consumer electronics. The power button remains in back, but that’s perfectly fine, as it now integrates a fingerprint sensor. You can still unlock your phone with LG’s fun-to-use Knock Code feature, but I’ve been finding myself using the fingerprint reader instead. It’s at least as fast and accurate as the sensor on the Nexus 6P, though the sensor itself is notably smaller than Huawei’s. The upshot? Both the new volume rocker and fingerprint sensor bring LG’s flagship line firmly into 2016. The volume rocker in its new happy home. Unfortunately, I can’t sing the same high praise for LG’s Always-On display. This feature shows you the current time and (ostensibly) notifications, even when your phone is sleeping. LG says the hit on battery life is minimal, using just 0.8 percent of battery capacity per hour. All that sounds great on paper, but the Always-On Display is so dim, I found it to be almost useless. The idea is that the G5 will show you easily grokked, glanceable information when the phone is sitting on your office desk. But the screen is almost illegible, and instead of seeing full notifications, all you get are icons of the apps that need your attention. An always-on display is great in theory, but LG’s application (right) is too dim to be useful—at least compared to Samsung’s almost identical feature. The bottom line is that Samsung’s always-on feature is much brighter, and the Ambient Display feature built into pure Marshmallow phones (like the Nexus 6P) reveals much more detailed notification information. Hopefully LG will address these issues in the final shipping version of the G5. If nothing else, it would be nice to have a brightness control for the Always-On Display—assuming LG thinks the average smartphone user can be trusted with such fearsome power. Except that it doesn’t. Or, at least it hasn’t over the last 24 hours of testing. With dual cameras and a fingerprint sensor on the back panel, LG is moving its flagship phone line forward with new tricks. For what it’s worth, you can now organize your LG home screen apps by alphabetical name or download date. I haven’t found these sorting controls to be a fair replacement for the app drawer, but, hey, LG makes them available. And on the plus side, you can ditch LG’s home screen entirely, and pick the Google Now Launcher, which keeps the app drawer intact. LG exposes this launcher directly in a Select Home setting. Other interface changes can be found in the camera app—and they’re big, big changes. The G5 comes with two rear-facing cameras. The main camera has an f/1.8 aperture, and shoots 16-megapixel images with a relatively traditional 78-degree field of view. But let’s say you want a wider angle shot. Let’s say you want to get more people into the frame, or want to shoot a sweeping vista. Simply by pinch-zooming in the camera preview, you can automagically switch to the second camera. It has a f/2.4 aperture, and shoots 8-megapixel images in a 135-degree field of view. Here we see the wide-angle rear camera in full effect with a 135-degree field of view. Note the slight distortion on the edges of the image. At the very top of the preview interface, you can also see how the wide-angle icon is lit in green. I haven’t done any serious photo testing (remember: we’re looking at a pre-production preview unit). Still, I can see people using the second camera—its poorer specs notwithstanding—for certain situations. I also give props to LG for continuing to deliver the best software camera controls in the smartphone space. (Because, yes, all the amazing manual cameras controls that made the G4 so great—including manual focus, ISO settings and a 30-second shutter speed—remain in the G5). In the image above, note the little green bar toward the bottom of the zoom slider. This is the point at which one camera hands off duties to the other. When you’re pinch-zooming, the software also “catches” at the point of the camera transition, requiring extra pressure before you make the switch. See, it’s the little things that separate great design from merely good. The dual-camera Pop-Out Picture mode is probably best avoided... unless you’re rushing to complete your 6th grade class project on ugly things. OK, so that’s the basic dual camera concept. But it can also be used with more malevolent intent. A new Pop-Out Picture mode let’s you combine two images taken with both cameras on a single click. The interior image comes from the wide-angle lens. The exterior image is shot by the standard lens, and here you can apply all sorts of special effects. BUT PLEASE DON’T. Just look at the screenshot above. It’s worse than Snapchat. Once again, I have to remind you that we tested a pre-production preview unit. The final user experience could change. Still, we did run some benchmarks, and found that from a pure performance perspective, the LG G5 ran in the same ballpark as the Galaxy S7, which shares the same Qualcomm Snapdragon 820 processor. Actually, it’s perhaps unfair to say they were in the same ballpark. They were practically sitting in the same seat. In the 3DMark Sling Shot OpenGL ES 3.0 test, the G5 mustered a score of 3276 to the GS7’s 3315. In the 3DMark Sling Shot OpenGL ES 3.1 test, the G5 hit 2530 to the GS7’s 2554. In the PCMark Work Performance test, the G5 hit 5780 to the GS7’s 5774. These are essentially 1 percent deltas. Or less. We’ll do more testing with the final review unit, along with the all-important battery rundown test, which is what really matters if you’re a typical smartphone user. Regardless, the G5’s interface was speedy as hell, and everything felt faster than my Nexus 6P running the Snapdragon 810. The Cam Plus accessory adds manual camera controls and a second battery to the G5. LG tells me that we should see final hardware in the next two weeks. Even better, I’m told they’ll be shipping two of the Friends accessories—almost certainly the Cam Plus (which mates manual camera controls and a supplementary 1200 mAh battery to the G5’s chassis) and the Hi-Fi Plus (which mates a Bang and Olufsen-powered digital-to-audio converter for a richer sound experience). These could be the truly useful innovations that LG adds to the smartphone scene. Or they could just be expensive add-ons that only look good on paper. But, hey, whichever way they go, they’re bound to be interesting. Again, we have to give LG kudos for thinking big and rolling the dice.